On January 29, 1942, without warning, one torpedo of a four-torpedo spread from U-132 slammed into Alexander Hamilton's starboard side, directly abeam of the stack. The blast destroyed three of the ship's seven boats. The interior of the ship was plunged into darkness-no heat, steam nor electricity remained. ... Alexander Hamilton settled low in the water. Comdr. Arthur G. Hall, USCG, ordered abandon ship with the ship powerless and in imminent danger of being torpedoed a second time. ... 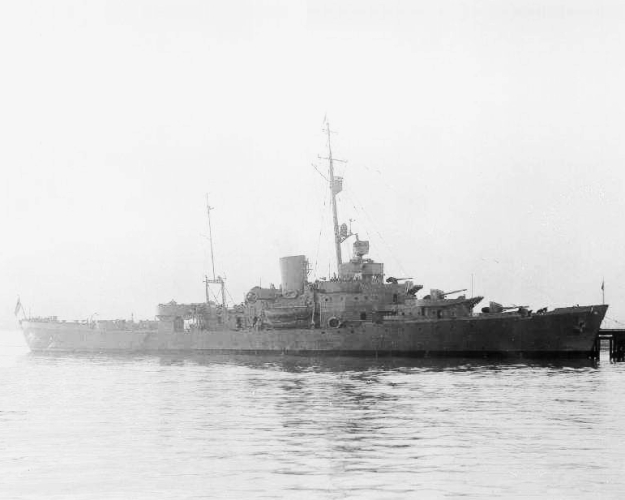 Eight officers and 75 enlisted men went over the side into the four remaining boats, USS Gwin came alongside later to take off the last of the cutter's crew. Throughout the night, Restive, Frisky, and the Coast Guard tug Redwing attempted to salvage the ship, but without success. ... Twenty-six men were killed instantly, six died later of the injuries sustained in the torpedoing. Ten more injured men required hospitalization.